Paul Pogba and Jose Mourinho's training ground disagreement was caused by a misunderstanding over an Instagram video, Manchester United midfielder Andreas Pereira has confirmed. United's manager and the French midfielder made headlines last month after Sky Sports’ cameras caught them engaged in what looked like a verbal disagreement at training. 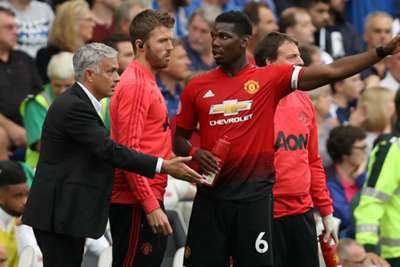 Pogba greeted United's coaches and players but then reacted following something Mourinho said, with reports suggesting the manager was asking about a post on social media published just after the EFL Cup penalty shoot-out defeat to Derby County. Pereira has now clarified what happened between the duo, telling Brazilian outlet UOL Sport: "We were winning the game 1-0 at the time of the video. "Then we lost the game, and people said that Pogba posted later. But he posted before. "The manager thought that Pogba had posted later. He asked him why that had happened. There was a mood about it. These things were out here in England. But I have nothing to do with it." Mourinho's relationship with his players has been in the spotlight this season, but Pereira – who has made four appearances in all competitions – insists he has no problems with the Portuguese coach. "The relationship is good, it's cool," he added. "I have a very good relationship with him, with the players and he also has a good relationship with the players. "We don't feel that pressure coming from outside. Everyone says that he's being sacked. We do not feel that. "I don't usually have any English media on my phone so I don't get intoxicated with everything they say. "He's our manager, we give our life on the pitch for him and for us too. Everyone is very calm, very focused and very happy."